Dentures are prosthetic devices constructed to replace missing teeth; they are supported by the surrounding soft and hard tissues of the oral cavity. Conventional dentures are removable (removable partial denture or complete denture). However, there are many denture designs, some which rely on bonding or clasping onto teeth or dental implants (fixed prosthodontics). 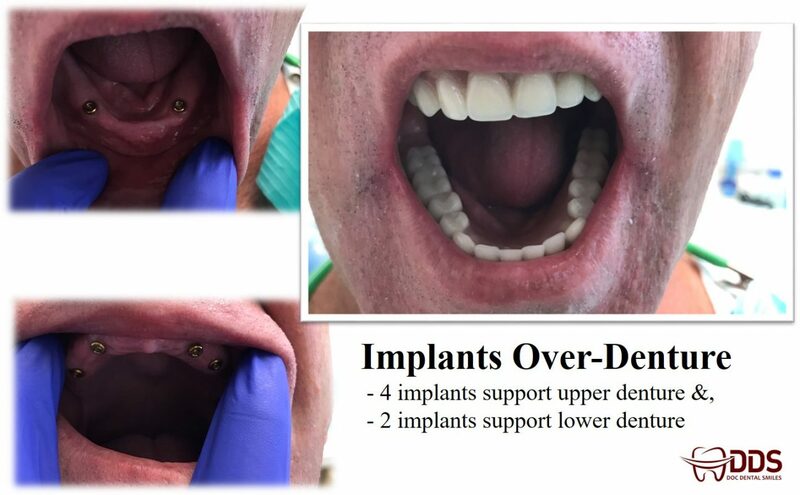 Removable partial dentures: Removable partial dentures are for patients who are missing some of their teeth on a particular arch. Fixed partial dentures, also known as “crown and bridge” dentures, are made from crowns that are fitted on the remaining teeth. They act as abutments and pontics and are made from materials resembling the missing teeth. Fixed bridges are more expensive than removable appliances but are more stable. Another option in this category is the flexible partial, which takes advantage of innovations in digital technology. Flexible partial fabrication involves only non-invasive procedures. Dentures can be difficult to clean and can affect oral hygiene. Complete dentures: Complete dentures are worn by patients who are missing all of the teeth in a single arch-i.e., the maxillary (upper) or mandibular (lower) arch-or, more commonly, in both arches. Mastication or chewing ability is improved by replacing edentulous areas with denture teeth.